Various coffee-themed poems I have written, with more to come. Writing poems is one of my numerous hobbies. I make no claim to quality, but I enjoy writing them. 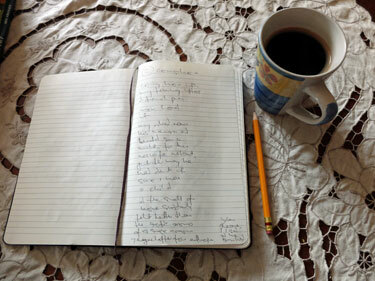 As you’ll see, coffee is a central part of each of the following poems. Some are light-hearted, others less so. All are written by me. heating milk for his Nescafé instant. when my mother wasn't looking. of a childhood at the stove. taste profile of his first cup. crap beans and leave mine alone. in our usual, casual way. at my ease and my easy time. as if in shared relief. But all I felt was shame. the cleanest sock we could find. whether it was good or bad. silly as we rinsed it in the stream.